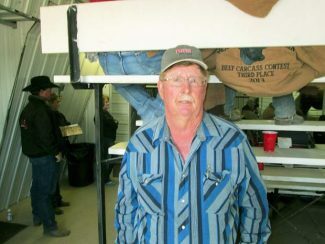 Pieper Red Angus hosted what I thought was the largest crowd ever for their annual spring production sale. Bidders came from every direction. This also proved to be the best sale ever for this progressive Red Angus seedstock firm. Many bulls sold out to registered breeders, but the commercial trade is still the strength of this sale. Last year Mark Pieper bought over 40,000 cattle for his order buying service, and many of them would have been from his customers' calves. Many repeat buyers were on the seats to compete on this good set of bulls. Top selling bull of the day was Lot 19, selling for $77,500 to Bradbury Land and Cattle, Byers, Colorado. He was a son of LSF Saga 1040Y and out of a Conquest daughter with an MPPA of 102.9. This good bull had an IMF of 5.22 to ratio 132. His rib eye was 15.58 sq. in. and ratioed 105. Born at 71 pounds, he weaned at 730 pounds and posted a yearling weight of 1402 pounds to ratio 115. He had EPDs of CED 11, BW -2.4, WW 78, YW 131, MILK 22, STAY 15, MARB 0.81, and RE 0.31. The hands were waving when Lot 1 showed up for the sale. With a final bid of $55,000, Jordan Rhodes, Faulkton, South Dakota, and Select Sires, Plainville, Ohio, were the new owners of PIE Cinch 4126. This herd bull prospect had a good disposition and a moderate frame. He was sired by LSF Saga 1040Y, and out of a daughter of HXC Conquest 4405P who had a 105.7 MPPA. Born at 73 pounds, he weaned at 769 pounds to ratio 116, and had a yearling weight of 1418 pounds to ratio 117. This calving ease bull had EPDs of CED 10, BW -4.0, WW 68, YW 115, MILK 25, and STAY 14. His HerdBuilder score was 147 and Gridmaster 53, along with a 40 cm. scrotal and a 15.9 sq. in. rib eye. At $25,000, Willow Bar from Canada became the owners of an impressive bull, Lot 10, PIE Specialist 430. This calving ease bull was sired by LSF Saga 1040Y and out of a daughter of PIE Code Red 9058. With a 68 pound birth weight, he weaned at 710 pounds and grew to a yearling at 1292 pounds. His EPDs included CED 8, BW -4.7, WW 63, YW 106, MILK 20, STAY 14, HB (HerdBuilder) 162 and GM (GridMaster) 54. Two bulls were sold at $19,500 each. Lot 9, a son of LSF Saga 1040Y and out of a daughter of Red Northline Trueblood, Known as PIE Commander 488, he had an 82 pound birth weight, a weaning weight of 801 pounds, and a yearling weight of 1402 pounds. His 40 cm. scrotal and a rib eye of 15.5 sq. in. complemented EPDs of BW -2.6, WW 68, YW 109, and MILK 20. He sold to Kathy Stalcup, Gillette, Wyo. Also at $19, 500, Lot 12, PIE Saga 468, was swept up by the partnership of Sandy Willow Red Angus, Waubay, South Dakota, and Gill Red Angus, Timber Lake, South Dakota. This son of LSF Saga 1040Y was out of another Red Northline Trueblood daughter. He had a 17 sq. in. rib eye and a 41 cm. scrotal measurement. Born at 89 pounds, he weaned at 834 pounds to ratio 119 and went on to post a 1427 yearling weight to ratio 113. His EPDs were BW -0.2, WW 78, YW 125, MILK 23, and STAY 13. Lot 50, another son of LSF Saga 1040Y, sold for $17,500 to D & D Cattle, Herman, Nebraska, for $17,500. Lot 2, sired by LSF Prospect 2035Z, sold for $17,000 to Jason Gregg, Carter, South Dakota. This bull had a 41 cm. scrotal measurement, a 16.7 sq. in. rib eye, along with a marbling score of 4.85. Lot 3, sired by Red SSS Oly 554T, sold for $17,000 to Randy McEntire, Sweetwater, Oklahoma. This low birth weight bull had a 15.9 sq. in. rib eye and an IMF of 5.85. The Piepers always treat their customers to a fabulous dinner, and this day was no exception.